Sue: I bet the Moon was very topical when this first went out. Sue: I’m not convinced by the Ronson hairdryers on their backs. And their helmets are steaming up something rotten. When a base commander tells us that we’re on the Moon in the year 2070, Sue sighs. Sue: I realise that the Doctor can’t control the TARDIS at this point, but what I don’t understand is why he doesn’t know when and where he is. That seems like a pretty fundamental piece of equipment to have on a time and space machine, don’t you think? A tiny display with the date and a little map that says, ‘You are here’. How hard could that be? Even my iPhone can do that. Me: The TARDIS gains that ability eventually. Sue: The Doctor should install that feature immediately. It’s ridiculous when he blunders around without the basic facts. No wonder he always ends up in trouble. It doesn’t take Sue long to realise that the Moonbase is an international concern. Sue: That’s the worst French accent I’ve ever heard. Me: That’s André Maranne. He’s French. Sue: Are you sure? He sounds like he’s trying to impersonate Raymond Blanc. Me: And you have the temerity to accuse the 1960s episodes of being racist. A mysterious plague has swept through the base (infecting Jamie in the process), and it’s this, and the isolated location, that reminds Sue of something vaguely significant. Me: You’re referring to the Howard Hawkes original, of course. Sue: Yeah, obviously. If that’s the one where the guy’s head falls on the floor and turns into a giant spider. When she isn’t comparing The Moonbase to The Thing, she’s comparing it to a gay sauna. Sue: Everyone on this base is very camp. Even the ones who aren’t wearing cravats and shower caps. And then Sue’s saviour turns up. Sue: Ah, someone called Bob. I like a good Bob. You can’t go wrong with a good Bob, and this Bob looks like a proper Bob. I bet he comes from England. Birmingham, probably. Me: He’s from New Zealand, I think. Sue recognises the Cybermen from the shape of their shadows, which blows the surprise cliffhanger out of the water. But the most remarkable moment by far occurs when Polly gets the screaming ab-dabs as she witnesses a door closing. Sue: Get a grip, pet. 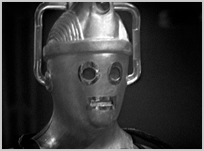 And then, as the still images flicker to life once again signalling the arrival of another cliffhanger, a Cyberman shows its radically redesigned face. Sue: I prefer the originals. Sue: How did Polly recognise that Cyberman? It doesn’t look anything like the ones she met. Me: You recognised the Cybermen just fine yesterday, and you only needed a shadow to do it. Sue: Yeah, but I’ve seen plenty of Cybermen in my lifetime. I’m not 10 years old, you know. 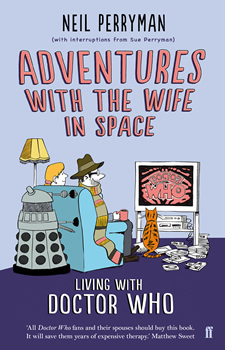 And do I have to mention the little Cybermen dolls on your bookshelf again? Sue isn’t a fan of the Doctor’s “some corners of the universe” speech. Sue: He’s all talk, this Doctor. It’s easy to make a speech like that, but when is he actually going to do something? Me: You could argue that this is the moment when the Doctor finally becomes the Doctor. While I labour this point, the Doctor is up to his neck in test tubes as he tries to find a cure for the virus. Sue: So the Doctor becomes the Doctor when he’s pretending to be a doctor. That’s interesting. 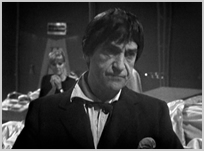 Me: How do you feel about Patrick Troughton now? Sue: He’s all right, I suppose. Sue: He’s not doing it for me yet. I wouldn’t want to travel with him, that’s for sure. He’s very passive-aggressive. Jamie is still out for the count in the medical bay. Sue: He looks like he’s strung out on nicotine patches. Perhaps the pipe he’s calling for is stuffed with tobacco? Me: What have the Cybermen got against Jamie? That’s the second time one of them has passed up an opportunity to abduct him. The Doctor asks Polly to put the kettle on. Again. It’s like the 1967 version of ‘Bad Wolf’. Sue: The sexist pig. And just when I was beginning to like him. When a Cyberman leaps off a table to confront our heroes, Sue has her eyes on other things. Sue: Ooh, there was some major furniture wobble there. Still, that’s what you get when you lie on a table that’s designed for pasting wallpaper. There’s no stability. And then our experiment came to a premature end. Sue: And you can call that stupid blog of yours Adventures with the Ex-Wife in Space! Me: Does that mean if I divorce you, you’ll still carry on with it? Sue: Don’t try to be clever, Neil. I almost said “Clever, clever, clever” at this point, but we haven’t reached that point in the story yet, and it didn’t feel appropriate. In fact, things were so bad, I even drafted a final, melodramatic, “It’s all over, folks” epilogue for the blog, but common sense prevailed in the end, and we kissed and made-up before I could post it. Sue: I don’t like the Cybermen’s new voices. Me: That’s a shame. They’re probably my favourite of all the Cybermen voices. Sue: It’s a Dalek rip-off. The sing-song lot were much more frightening. And why do they have accordions strapped to their chests? Watch out, they could break into a polka at any moment. 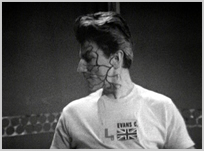 Just as she’s putting the Cybermen down, they zap Bob in the chest. Sue: Noooo! They killed Bob! Brave, burly Bob! 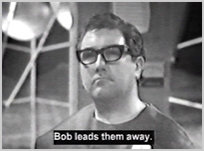 She’s relieved when she learns Bob isn’t dead after all – he has been taken away to be ‘converted’ (“I know how he feels”). Cue some barely comprehensible exposition where the Cybermen lay out their plans for destroying planet Earth with bad weather. Sue: This Cyberman is very sarcastic with his “clever, clever, clever” routine. But doesn’t that mean he has emotions? That doesn’t make any sense, Neil. Meanwhile, Polly, Ben and Jamie hatch a plan to defeat them. Sue: At least Polly is trying to find a solution, and it makes a change from making the bloody coffee. It’s a bit like Blue Peter for terrorists, this scene. When Jamie and Ben vie for the role of alpha male, you can cut through the testosterone with a knife. Sue: I knew there was a love triangle brewing. Polly secretly loves the fact that these two want to fight over her. She won’t sleep a wink tonight. Despite their McGuyver-like ingenuity, Sue is less than impressed with their chosen delivery system for Polly’s deadly cocktail. It looks like they’re armed with Mr Muscle spray-cans. Me: I’m sure they converted some fire extinguishers in the novelisation. Sue: If anyone asks, they should say they’re there to clean the windows. And there are a lot of windows to clean. The plucky youngsters emerge triumphant when the Cybermen melt away to nothing. Sue: The Cybermen are a bit crap, aren’t they? How can you be a super-villain when you’re allergic to nail polish remover? It’s pathetic. 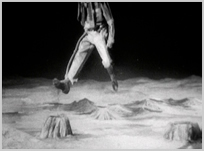 Sue: You can see the Moon’s floor bouncing up and down as they walk across it. Bless ’em. Me: It’s epic. It’s Cybermen marching across the surface of the Moon. Does it get any more iconic than this? Sue: I’m sure the kids enjoyed it. I definitely didn’t see this when it went out, or I’m sure I would have remembered it. Just when we think the enemy is contained outside the base, a cyber-slave named Evans threatens to overturn it from within. Me: His quiff makes David Tennant look like Bobby Charlton. Sue: It’s Sean Penn with varicose veins. Despite looking like a berk, Evil-Evans manages to bounce a rescue ship into the sun. It will take its crew over a week to die. Sue: This Doctor is far too dithery for me. He just let a spaceship full of people die. And it isn’t just him – the whole room is made of windows and nobody saw a thing. The base’s peripheral vision is shocking. Me: Could you imagine any other Doctor in this story? Sue: I suppose so. But it would be a lot shorter. They would have done something by now. Me: Some people argue that this story sets the template for the entire series. It’s called the ‘Base Under Siege’ formula. Sue: You mean they’re all going to be like this from now on? Really? Oh no. When the Moonbase’s hull is breached, the crew try to plug the gap with some loose fabric, but it doesn’t work. Strange, that. Sue: Stick Bob in there! He could plug it up! A tray, which Polly was using to serve coffee on earlier, saves the day. I think it’s worth pointing out here that Kit Pedler was a real scientist. Me: I’m surprised the French bloke hasn’t surrendered already. Sue: I love the way the lead Cyberman reacts to the fact that their big gun doesn’t work. It’s priceless. And then, with only a few minutes left to spare, the Doctor comes up with a cunning plan. Sue: It’s about ****ing time. The plan, such as it is, involves hanging onto a very expensive piece of equipment and hoping for the best. Sue: The Doctor couldn’t even sort this out himself – the commander had to do all the heavy lifting, and he’s probably 70 years old! This Doctor is just taking the piss. The commander is the real hero. When the Cybermen drift aimlessly away into space, Sue laughs. But it’s an affectionate laugh. I think. Back on the TARDIS, the Doctor has found the button that activates the ship’s previously unheard of ‘Trailer Mode’, and he gives his companions a preview of their next adventure. Polly practically wets herself with fear. Sue: Would you really scream at a crab claw like that? It could be a normal-sized crab claw hanging off the camera for all she knows. From a rock pool in Cornwall, probably. Sue: That was a good effort, I suppose. This Doctor still isn’t doing it for me though. He needs to buck his ideas up. Sue: Put the kettle on, love. I don’t know why, but I could murder a cup of coffee.